The beginning of this month we had very much rain and warm weather. It is a general rule, that when the wind blows twelve hours in any part of the east, it brings rain and snow in great abundance. 4.] Wahginnacut, a sagamore upon the River Quonehtacut (Connecticut) which lies west of Naragancet, came to the governor at Boston, with John Sagamore, and Jack Straw, (an Indian, who had lived in England and had served Sir Walter Raleigh, and was now turned Indian again,) and divers of their sannops, and brought a letter to the governor from Mr. Endecott to this effect: That the said Wahginnacut was very desirous to have some Englishmen to come plant in his country, and offered to find them corn, and give them yearly eighty skins of beaver, and that the country was very fruitful, etc., and wished that there might be two men sent with him to see the country. The governor entertained them at dinner, but would send none with him. He discovered after, that the said sagamore is a very treacherous man, and at war with the Pekoath (a far greater sagamore). His country is not above five days journey from us by land. 13.] Chickatabot came to the governor, and desired to buy some English clothes for himself. The governor told him, that English sagamores did not use to truck; but he called his tailor and gave him order to make him a suit of clothes; whereupon he gave the governor two large skins of coat beaver, and, after he and his men had dined, they departed, and said he would come again three days after for his suit. 15.] Chickatabot came to the governor again, and he put him into a very good new suit from head to foot, and after he set meat before them; but he would not eat till the governor had given thanks, and after meat he desired him to do the like, and so departed. 16.] There was an alarm given to all our towns in the night, by occasion of a piece which was shot off, (but where could not be known,) and the Indians having sent us word the day before, that the Mohawks were coming down against them and us. 14.] At a court, John Sagamore and Chickatabot being told at last court of some injuries that their men did to our cattle, and giving consent to make satisfaction, and now one of their men was complained of for shooting a pig, and for which Chickatabot was ordered to pay a small skin of beaver, which he presently paid. 13.] 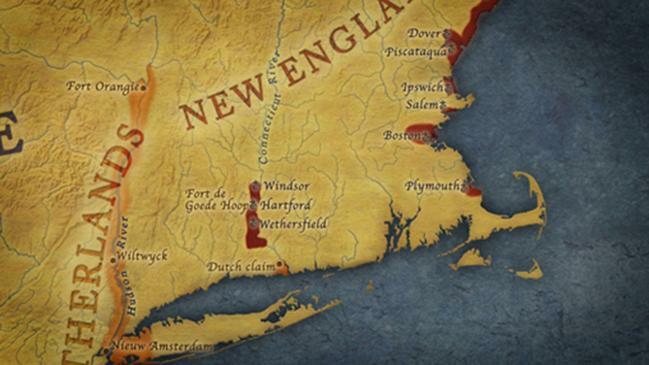 Canonicus, son of the great sachem of Naraganset, came to the governor’s house with John Sagamore. After they had dined, he gave the governor a skin, and the governor requited him with a fair pewter pot, which he took very thankfully, and stayed all night. 8.] The Tarentines, to the number of one hundred, came in three canoes, and in the night assaulted the wigwam of the sagamore of Agawam, by Merrimack, and slew seven men, and wounded John Sagamore, and James, and some others. 17.] Mr. Shurd of Pemaquid, sent home James Sagamore's wife, who had been taken away at the surprise at Agawam, and writ that the Indians demanded fathoms of wampampeague and skins for her ransom. 12.] The governor received letters from Plimouth, signifying, that there had been a broil between their men at Sowamset and the Naraganset Indians, who set upon the English house there to have taken Owsamequin, the sagamore of Packanocott, who was fled thither with all his people for refuge and that Capt. Standish, being gone thither to relieve the three English, which were in the house, had sent home in all haste for more men and other provisions, upon intelligence that Canonicus, with a great army, was coming against them. Withal they write to our governor for some powder to be sent with all possible speed, (for it seemed they were unfurnished.) Upon this the governor presently dispatched away the messenger with so much powder as he could carry, viz. twenty-seven pounds. 16.] 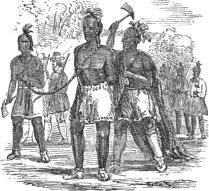 The messenger returned, and brought a letter from the governor, signifying, that the Indians were retired from Sowams to fight with the Pequins, which was probable, because John Sagamore and Chickatabott were gone with all their men, viz. John Sagamore with thirty, and Chickatabott with twenty to Canonicus, who had sent for them. Mr. Oldham had a small house near the wear at Watertown, made all of clapboards, burnt down by making fire in it when it had no chimney. 30.] Notice being given of ten sagamores and many Indians assembled at Muddy River, the governor sent Captain Underhill with twenty musketeers, to discover; but at Roxbury they heard they were broke up. 4.] One Hopkins of Watertown, was convict for selling a piece and pistol, with powder and shot to James Sagamore, for which he was sentenced to be whipped and branded in the cheek. It was discovered by an Indian, one of James’s men, upon promise of concealing him, (for otherwise he was sure to be killed). 1.] Mr. Edward Winslow chosen governor of Plimouth, Mr. Bradford having been governor about ten years, and now by importunity gat off. 2.] Capt. Stone arrived with a small ship with cows and some salt. The governor of Plimouth sent Capt. Standish to prosecute against him for piracy. The cause was, being at the Dutch plantation, where a pinnace of Plimouth coming, and Capt. Stone and the Dutch governor having been drinking together, Capt. Stone, upon pretence that those of Plimouth had reproached them of Virginia, from whence he came, seized upon their pinnace, (with the governor’s consent,) and offered to carry her away, but the Dutchmen rescued her; and of the council of Plimouth) to pass it by, yet, upon their earnest prosecution at court, we bound over Capt. Stone (with two sureties) to appear in the admiralty court in England, &c. But, after, those of Plimouth, being persuaded that it would turn to their reproach, and that it could be no piracy, with their consent, we withdrew the recognizance. 15.] Mr. Graves, in the ship Elizabeth Bonadventure, from Yarmouth, arrived with ninety-five passengers, and thirty-four Dutch sheep, and two mares. They came from Yarmouth in six weeks. 19.] A day of thanksgiving was kept in all the congregations, for our delivery from the plots of our enemies, and for the safe arrival of our friends. 2.] At a court it was agreed, that the governor, John Winthrop, should have, towards his charges this year, £150, and the money, which he had disbursed in public businesses, as officers wages, being between two and three hundred pounds, should be forthwith paid. 12.] Mr. Edward Winslow, governor of Plimouth, and Mr. Bradford, came into the bay, and went away the 18th. They came partly to confer about joining in a trade to Connecticut, for beaver and hemp. There was a motion to set up a trading house there, to prevent the Dutch, who were about to build one ; but, in regard the place was not fit for plantation, there being three or four thousand warlike Indians, and the river not to be gone into but by small pinnaces, having a bar affording but six feet at high water, and for that no vessels can get in for seven months in the year, partly by reason of the ice, and then the violent stream, we thought not fit to meddle with it. 24.] Much sickness at Plimouth, and about twenty died of pestilent fevers.